When you hear of a game called Salmon Run, you might think it’s about the treacherous and long journey that Salmon make every year, upriver, to return to their spawning pond and have more Salmon babies. Congratulations, you’d be exactly right. Salmon Run is a race for 2-4 (or sometimes 5) players up the river, over waterfalls, around rocks, and all of this while avoiding bears, eagles, and the occasionally rough current. Your hand of cards comes from your own personal deck, which starts out with mostly movement cards, but also a BEAR card. As you traverse the river, you will add cards to your deck when you pass through any hexagon space with an icon on it. You will also add “fatigue” cards to your deck if you move too much on your turn or when you jump over waterfalls or when the bear comes after you. Fatigue cards, of course do nothing except make it harder to move later, when you draw a hand full of them. 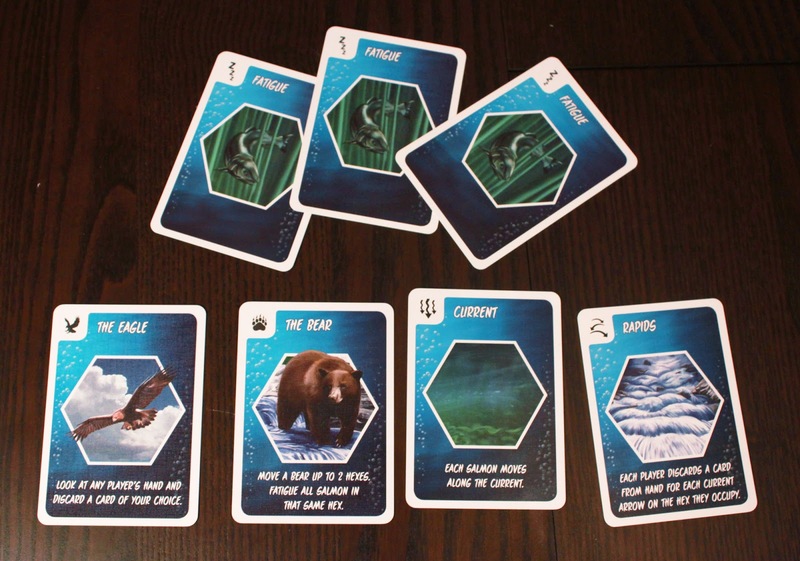 Other cards include the aforementioned BEAR which lets you move the bear towards other Salmon, an Eagle which lets you target someone’s hand, rapids and current which can force players to discard or move them backwards. There are also “double movement” cards which, as you guessed, allow you to move multiple hexes in one turn. It’s worth noting that any “attack” card – such as the “Current” card which sends everyone along one hex in the direction of a current arrow, which is usually backwards – affects all players equally, including the player who played it. It’s a race for the finish line, bears notwithstanding! During your turn you can play 3 of those cards out of a 4-card hand (usually), and when your turn is over you draw back up to 4 (and you do not discard any cards left in your hand first). 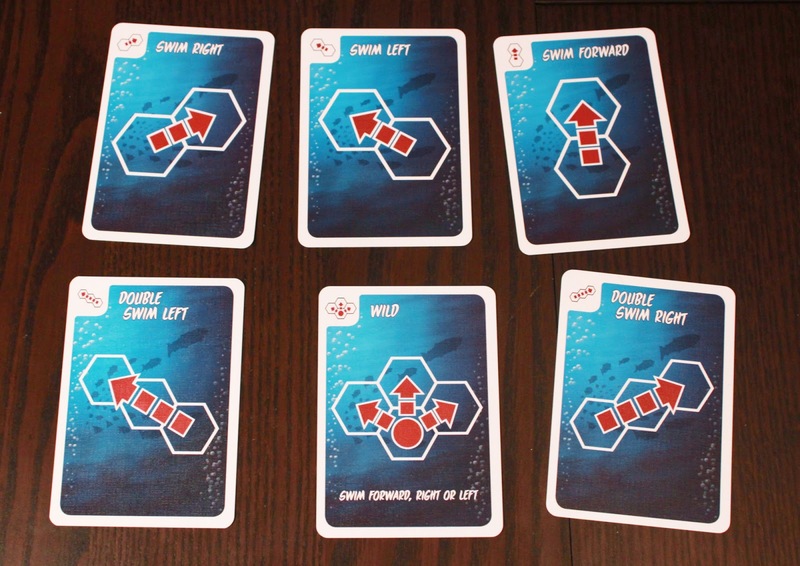 Whoever manages to land in the Spawning Pond first wins the game – unless after everyone has had an equal number of turns, more than one person has reached the pond, in which case the fish with the least fatigue is the winner. Salmon run is an interesting blend of deckbuilding and on-the-board racing. Actually it might be better to say that Salmon Run is a racing game with a clever use of the deckbuilding mechanism. While the tabletop universe is filled with games-that-are-exactly-like-dominion-with-minor-twists, there is plenty of room for alternate takes on the deckbuilding genre; different uses and functions of individual player decks that can be modified through the course of the game. The board can end up pretty wonky, which is actually kind of fun. While the deckbuilding aspect is not actually the major focus of the game – after all, you can only add a limited number of cards to your deck, and not enough compared to your starting assets to have dramatic impact on your deck – it does use deckbuilding in a fresh new way. You won’t be “buying” fish upgrades here. Instead, the game is all about planning your best route and managing your deck to be as efficient as possible. You can burn up your movement cards and hope to get a strong enough lead so that the fatigue you gain won’t come back to bite you at the endgame; or you can play it slow and steady, sort of a tortoise-vs-hare approach. It’s a better racing game than a deckbuilding game; in what other racing game does pacing matter? In what other game is the element of luck so subdued? Whereas most other racing games are based on great dice-rolling or lucky card draws or skilled finger-flicking, the race here is much more about managing your hand. To that end, good hand management should prevent any player from becoming stuck – at least, any experienced player. There is a slight learning curve. Though the rules are simple, there are a few tricks that it takes a few games to realize or remember. For example, you can often spend movement cards even if they run you straight into a rock wall. Sure you don’t move, but you get that card out of your hand allowing yourself to cycle more quickly to the cards you need to get out of a tight spot. You’ll also need to pay attention to the next few obstacles, and sometimes you might save a card you could use immediately because it will be much more useful the next turn. The basic strategy isn’t particularly deep here, which makes it more of a family game, and that’s just fine. In fact, I was able to play it with my kid nephew, and while he needed me on his team for at least the first game, it was fun to see him grasp some basic deckbuilding concepts. It brought a smile to my face as he thought through the cards we had drawn and used already and figured out which cards to expect to draw, which is exactly what deckbuilding is all about. All this within the context of a race to the finish, and it just works. This is much more fun to play than Candy Land or Sorry, at least for adults. But, yes, this is generally a family game. Your starting deck is fairly thick and will last several turns before even your first re-shuffle, which means each card you gain won’t affect your overall deck all that much. And your starting deck is fine, so you could theoretically gain no other cards (except the inevitable fatigue) and still win the game. You can never go backwards except by the “Current” card, which often means you will find yourself in a place where certain spaces – even those in front of you – are simply impossible to reach. As a personal preference, I’d prefer more deck-building functionality, but it’s just not that kind of game, and that’s okay. Some of the basic movement cards, as well as some of the more powerful cards, that you have to land in the right place to add to your deck. You can add a little more “gamer depth” by increasing the length of the river. The modular board not only has plenty of extra pieces, there’s no restricting how many you use in a single game. 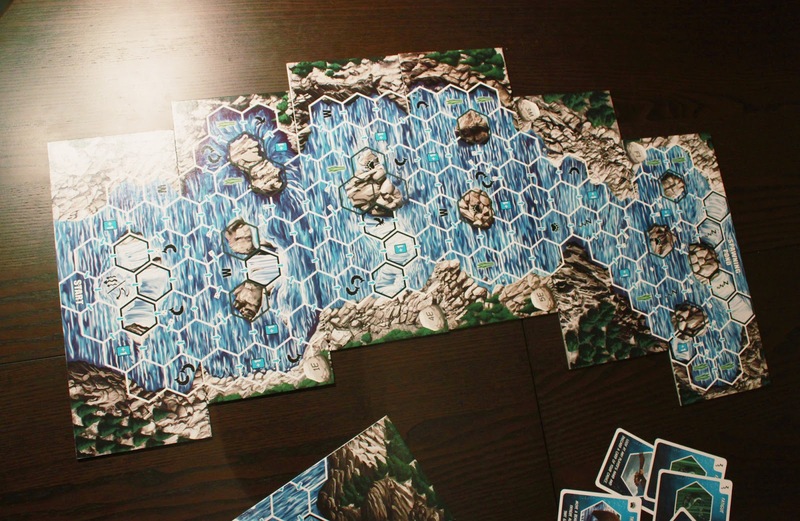 Changing the order and number of boards in the river forces players to re-think their favorite paths each game, and adding more boards to the mix forces the deckbuilding aspect more to the front. The longer the river, the more dangerous it is to push forward quickly early on; you’ll really need to save your breath, so to speak, for the right moment. More boards also means more opportunities to add and remove cards from your deck. Of course, it also means a longer game, and it could also mean longer suffering if one player accidentally falls behind at a key moment (such as a current card played right as they are at the top of a waterfall, which sends them back 2 spaces instead of everyone else’s 1, and of course requires them to jump over the waterfall again which is extra fatigue) they may never be able to catch up. Another option I came up with on my own is to simply remove 1 of each movement card from the starting deck – so instead of 3 of each left, right, and forward movements with a wild, you just have 2 left, right, and forwards, and no wild. This makes every card you add significantly more effective to mess up your deck, which accomplishes something similar to adding more boards but with less distance and less game time added. But this is not an official variant. The one element I’m not a huge fan of is the “reed” space, which allows a player to remove a card (or cards, depending on the space) from their hand, discard pile, or deck. The card removed will always be fatigue of course, and it is often smart to remove that fatigue from your deck since that will be coming up next – but that means essentially pausing the game as a player rifles through their deck to remove a card and then shuffles it again. It’s a minor slowdown, especially if it happens at the end of a turn instead of in the middle, but it happens. 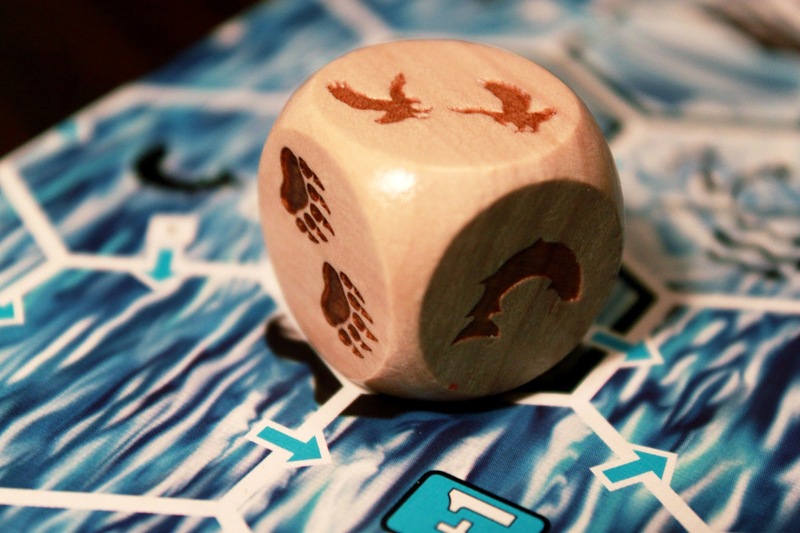 The die roll may determine where the current carries you… but this special die is only in kickstarter pre-orders I believe. It is pretty though. This game is best played quickly, although if you are playing with kids you will have to have patiences, since it’s going to require a bit more thought than your average wal-mart shelf kids game. It’s also best played with more players; 2 is okay, but there just isn’t that much going on. Bears get out of range quickly and Current cards don’t slow you down enough. But as you add in 3, 4, or 5 (the 5th player requiring a mini-expansion) this actually increases the interactivity between all players, as a series of Current cards can push people around and Bears tend to stay caught up with the group. Plus it’s just the sort of game that’s more fun with more people involved, inevitably making animal noises as they move the bear or splish-splashing their way up a waterfall. The components are stellar in so many ways, with cute little bear and salmon meeples, perhaps the best card stock I have ever handled in my life, and thick double-sided river boards that are printed clearly and have a wonderful tactile surface. I’m not a huge fan of the art, though. Not that the illustrations are poor – they’re just fine, and the animals depicted look great. It’s just predominantly blue, and while that kind of makes sense in a game that takes place entirely within a river, it would be nice to see some colorful plants and grass instead of neutral grey rocks and dull grass, to fill out the color palette. It’s just not as pretty, to my eyes, as it could be. But, at least the graphic design is solid and nothing gets in the way of the gameplay. One big, happy, fishy family! Speaking of which, I wouldn’t call this an “ameritrashy” game but the theme is implemented quite well. Okay I’m not exactly a big fish fan, but the theme immediately connects players with the mechanisms. When I first pulled the game out in front of my family, my mom asked if the goal was to race to the spawning pond. This is, of course, the exact goal of the game, and when that is immediately apparently, it is so much easier to explain the rules. Much like Pandemic, the theme serves the game and not the other way around. Overall, Salmon Run is a rather good game. It’s certainly a family game that is a lot more interesting than most games you can play with kids. It utilizes deckbuilding in a creative new way to make a more interesting, less luck-based racing game (although luck still has an effect. 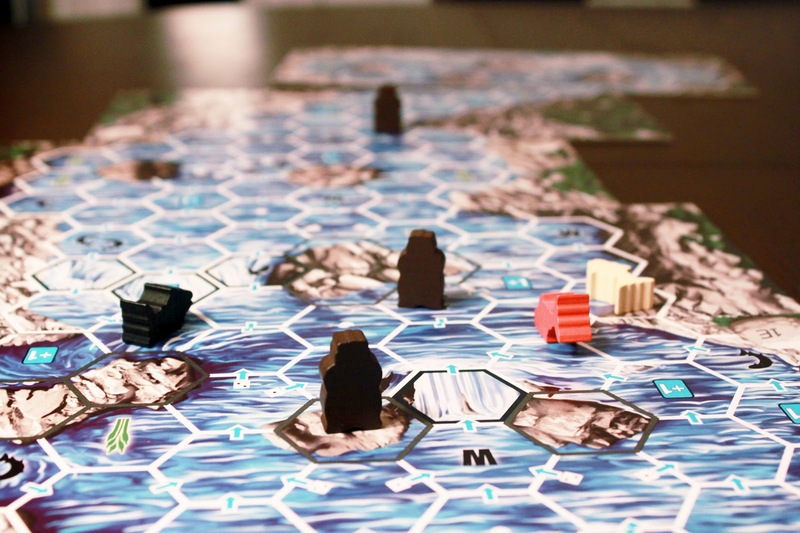 While it can be more strategic by making the river longer, I wouldn’t really call it a gamer’s game; more like a family game that a gamer could enjoy. The theme does a great job of serving the mechanics, but hopefully the fishiness of it all won’t turn off potential fans who might perceive it as something less than it is. 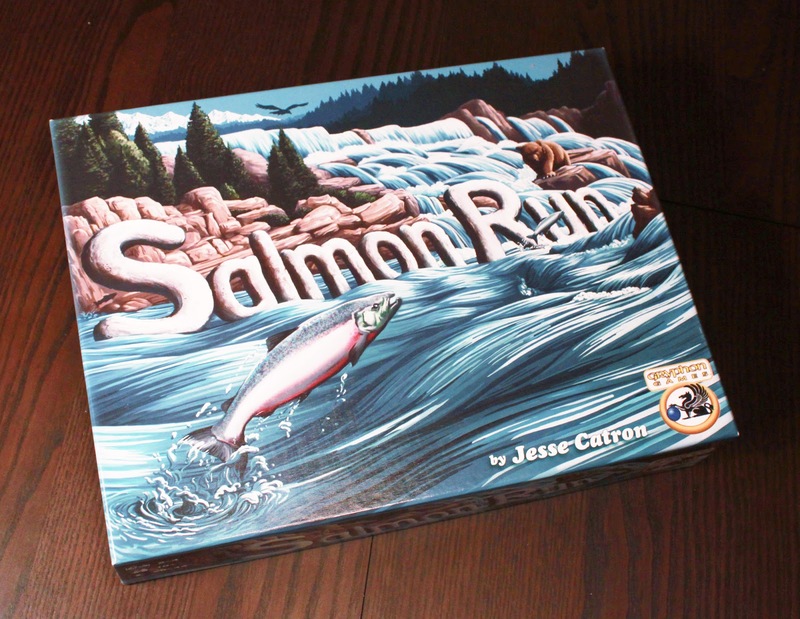 What surprised me most is that Salmon Run is designer Jesse Catron’s first published game. It feels like it came from the hands of an experienced designer; there is very little clumsiness, almost no rough edges, which is what I’ve come to expect from so many first-time designers and kickstarter projects. I’ll be looking forward to future projects from the mind of Mr. Catron. iSlaytheDragon would like to thank Gryphon Games and designer Jesse Catron for providing a review copy of Salmon Run. An excellent review, as always. I’ll throw my hat in the ring and agree that the components here are fantastic. Gryphon really went all out.